Looking for the perfect photo opp on your family's trip to London? 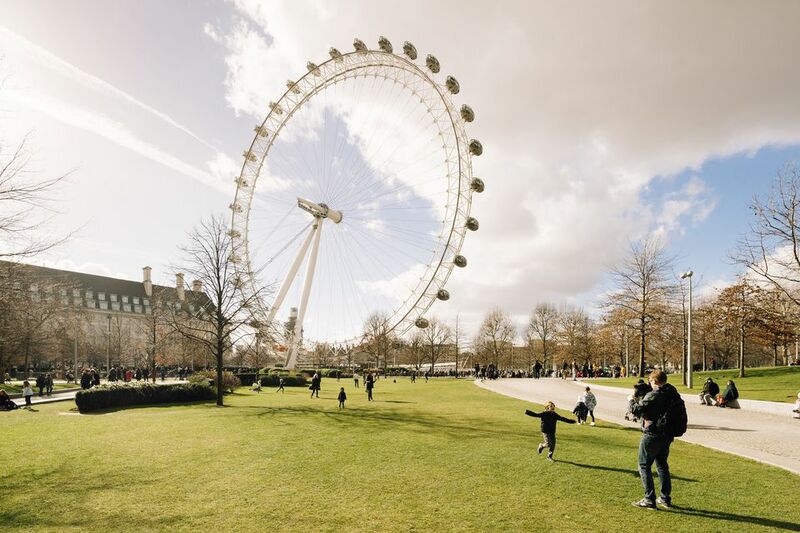 Since its opening in 2000, the London Eye observation wheel on the South Bank of the Thames has become as much a symbol of the British capital as Tower Bridge or Big Ben. Here are 15 fun facts you may not know about the London Eye. The observation wheel is the United Kingdom’s number one fee-based attraction. In an average year, the London Eye receives more visitors than the Taj Mahal and the Great Pyramids of Giza. Since opening in 2000, the London Eye has welcomed almost 80 million visitors. This wasn't London's first big wheel. The London Eye was preceded by The Great Wheel, a 40-car Ferris wheel built for the Empire of India Exhibition at Earls Court. It opened in 1895 and stayed in service until 1906. It was supposed to be temporary. Built to celebrate the Millennial, the London Eye was originally going to stand on Lambeth Council's ground on the banks of the Thames for five years. But in 2002, Lambeth Council granted the Eye a permanent licence. Don't call it a Ferris Wheel. The London Eye is ​the world’s tallest cantilevered observation wheel. What's the difference? The Eye is supported by an A-frame on just one side, and the carriages are outside the wheel rim instead of hanging low. There are 32 capsules or one for each of the London boroughs. The capsules are numbered 1 to 33, with no capsule number 13 for superstitious reasons. Each capsule weighs 10 tons or a whopping 20,000 pounds. In 2013, the second capsule was named the Coronation Capsule to mark the 60th anniversary of the coronation of Queen Elizabeth II and bestowed with a special plaque. If you add up all the rotations the Eye has completed in its first 15 years, the distance adds up to 32,932 miles, or 1.3 times the Earth's circumference. In one year the London Eye rotates 2,300 miles, which is the distance from London to Cairo. The London Eye can carry 800 passengers per rotation, which is equivalent to 11 London red double-decker buses. On a clear day, you can see as far as Windsor Castle, which is about 25 miles away. The London Eye is 443 feet tall, or the equivalent to 64 of the iconic red telephone booths piled on top of each other. To mark special occasions, the Eye is often lit up in different colors. For example, it was lit red, white and blue for Prince William and Kate Middleton’s wedding.